Quebec's immigration from Haiti rocketed by 80 per cent last year as many residents displaced by the massive earthquake looked for a new home in Canada. Quebec's Immigration Minister Kathleen Weil said more than 3,000 Haitians arrived in Montreal in the year since the earthquake, under an array of federal and provincial immigration programs. "Both governments really decided to prioritize the Haiti file so we could bring in these people who were obviously in a certain situation of urgency to arrive," she said. But many Haitian Montrealers have criticized Quebec and Canada's immigration efforts, saying the doors were not open to all who applied. Neil Armand said Quebec boasted it was fast-tracking family reunification based on humanitarian considerations, but he said only those with a middle-class income qualified to sponsor relatives. "They were saying if your family has enough money, you can bring them here. Does it mean that the people over there — the families with more money — were in more necessity than others? What kind of priority is that?" Armand said. Still, Weil said Haitian Quebecers applied to sponsor more than 8,000 family members under that special program. She said some 3,000 have been selected so far and expects that number to climb to 5,000. Meanwhile, Canada's Immigration Minister Jason Kenney said Tuesday it may be years before international adoptions resume from Haiti. 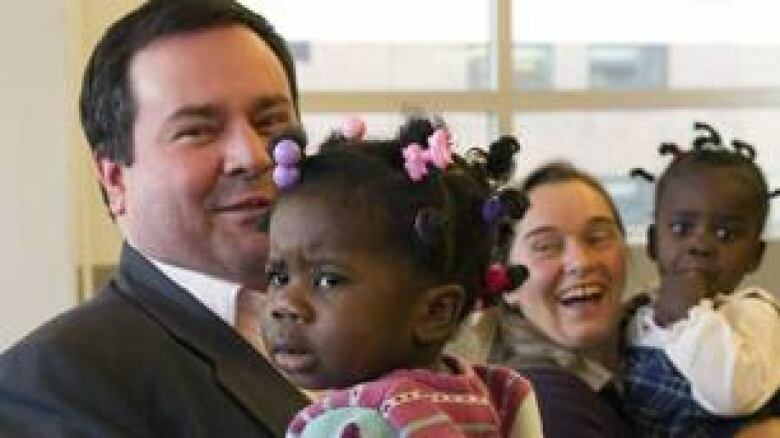 Kenney, who was in Montreal to meet orphans flown out of Haiti in Operation Stork one year ago, said there is a moratorium on adoptions from the country. The adoptions of 203 children who were flown out in that operation had already been in the works when the earthquake struck. But Kenney said any new adoptions from the battered country would not resume. Kenney said international agencies want to avoid the child trafficking problems that followed the tsunami in South Asia. "Frankly, when the whole system breaks down, you don't know whether kids are really orphans," he said. "You don't know if the parents have given consent or if the children have been kidnapped or trafficked."